When you buy Premium, you gain access to your own Premium portal! This is an overview of all the different features of the portal, with summaries and screenies by two different Premium members. The Center Modules are, obviously, down the center of the page and are the most important ones. TNT entrusts premium users to test out games before they are released to the general public. 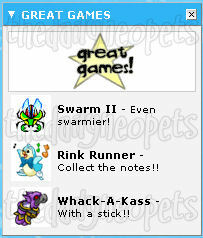 From this module you can view the current beta games and are able to easily get to the games page in the game room and submit feedback about the game to Neopets. 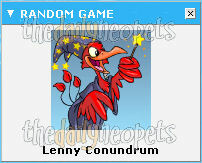 When you are playing the Neopets stocks you have to make quick and accurate decisions. This module allows you to view your 5 most changed stocks, their stats, and be able to decide whether or not to sell them. This is a list of your Neofriends and they're online status. The envlope next to the names is a link to neomail them, and the red circle with a slash is to remove them. Stealth mode will change your time online to Stealth! and Visible mode changes it back to normal. Viewing your first 5 neomails is important. While being able to see your new, unread neomails you can also quickly send neomails, access your folders, neofriends, diary, greetings, and your block list. Real world news, Neopets news, The Neopian Times, and todays featured game can all be view with the click of a button in this module. Showing the first few sentences from each news source and some cool game details for the feature game. The Portal Feedback gives links to the Premium report forms, and lists recent additions to Premium. The "BOSS" button is a spot in the lower right hand corner of the page that's solid color instead of the footed picture. If you click on it, the portal takes on a very business-y look. It's ment to fool your boss into thinking you're working when he walks by. Of course, it's just a joke and doesn'td actually disguise it that well, but it's really nice looking. Just click the same spot again to change back. 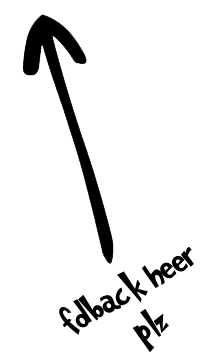 Type a word into Dictonary and get a definition, and type a word into Thesaurus get a list of related words, synonyms, near antonyms, and antonyms for that word, as well as some short definitions, all from Merriam-Webster Online. This is a list of stocks in real life (DOW, FOSL, NASDAQ, ect), as well a little business news. Most people don't pay too much attention to it, but if you want to know about them, it's a nifty little feature. One of premium users favorite modules is the Super Shop Wizard. 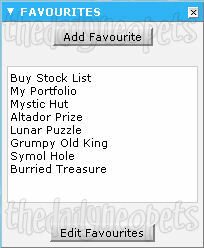 This acts just like the shop wizard except it searches through all the shops of Neopia and gives you a list of cheapest items out there, in order from least to greatest. Webmail shows what e-mails you have in your @neomail.com e-mail account. This account is what you're tecnically paying for when you get Premium. All the other stuff is the icing on the cake. Side modules go down the sides on the page on both the left and right.They are slightly less important and some of them you might not need at all, but they are there none the less. Here you can keep track of what items you have up for auction, how much the current bid is, what the asking price is, who bid last, and how much more time is left on the auction. At the bottom is a link to the bids page. Instead of opening up an entire new program, you can add, subtract, multiply, and divide everything from pricing items in your shop to seeing how many neopoints you need to save for that rare paint brush you want. This has both a normal face clock and a number one. The image on the background depends on what theme you're using. 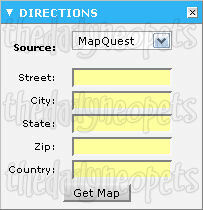 Simply use this module to get real life directions to anywhere in the United States. This shows you your rank in your guild, how many posts there are that you can view, and who posted the last 5 posts as well as the titles to the posts, and sometimes a small part of the post. Some of the greatest games played in Neopia are displayed in this module. 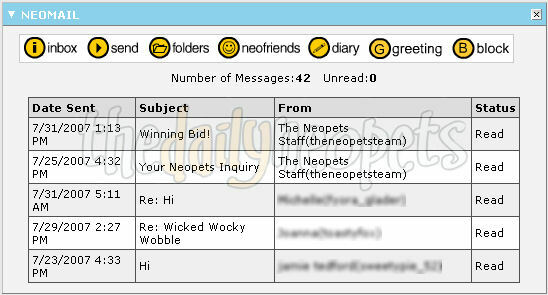 These games are popular older games that are vital to the Neopets economy. Here, you can type in your zip code, the radius you want to search in, and of you want to find movies, theaters, or cities in that radius. It's great for finding a theater near you, or looking for cities in random zip codes. This just shows any games that you're on the hiscore table for, and what your rank and score on that game are. Use this module to stay up-to-date with the latest scores and more in each months Multiplayer Competition. This shows all of your items in a neat little area that you can scroll off to the side. They're ordered by release, and items you have more than one of are shown once with the number underneath. 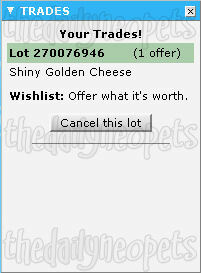 It also tells you if an item is auctioning, in a trade, or is wearable. You can click on them just like in your normal inventory and use them. Using the Portal Prefrences, you can set your home town and the weather forcast for there will be shown here for today and the next week. 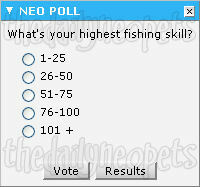 Neopets puts out many neo polls to get users opinions. 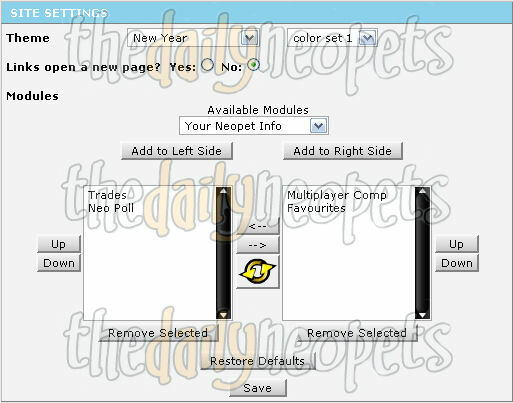 From your portal, if you have this module active you can answer each poll that comes up and give Neopets your ideas and suggestions. The poll changes each time the page loads. This shows the weather in all the different worlds on Neopets. It's great for checking to see if there's stormy weather somewhere for the Gloomy avatar. 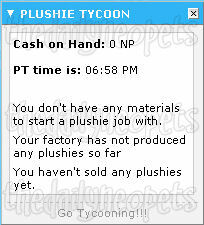 Your stats (if any) to the complex game, Plushie Tycoon, are shown in this module. A tool that lets you see all your current trades, along with how many offers are currently on each lot. This calender not only keeps track of dates and lets you record events on it, it has links to the word of the day and what's happened on the day in the history of Neopets! Like the pet quick ref on the left side on the new layout, this shows your active pet. 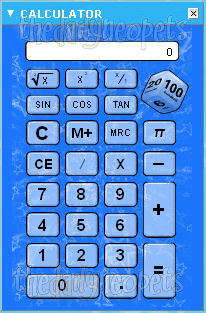 Of course, this also includes all of your pet's stats, your neopoints on hand, in the bank, and in your shop till. You can select another pet to view by clicking their name at the bottom. All this module does is display a random game for you to play. This actually is not a module, thus making it not removable or editable. Located at the top of the portal, all the important premium links, such are referrals, premium neoboards, ect. are listed. And that's it! All of the module choices for the Premium portal. 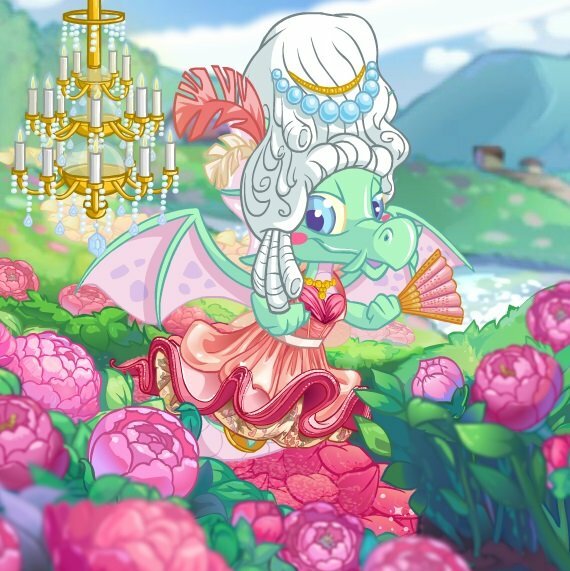 Interested in trying Premium Neopets? Check out our How to Sign-Up page. The Snowager is awake. He'll be sleeping in 4 hours, 16 minutes.